David is an Associate Professor of Mechanical Engineering and Biology at the Georgia Institute of Technology. He received his Bachelor’s in Mechanical Engineering and PhD in Mathematics from the Massachusetts Institute of Technology. He received a National Science Foundation Postdoctoral Fellowship to conduct research at New York University and worked afterward as an Instructor of Mathematics there before joining the faculty at Georgia Tech. David and his fascinating research have been featured in the media nationally and internationally including appearances in Discover Magazine, New York Times, USA Today, Scientific American, The Guardian, BBC, NPR, National Geographic, Cosmo and many others. David is here with us today to tell us all about his journey through life and science. David likes to play squash in his free time, and he and his graduate students typically play once a week. Another activity that has been occupying David’s free time is learning Chinese. This has been very useful since he is collaborating with researchers in China, working on writing grants in Chinese, and is also preparing to participate in a Chinese game show. David is an engineer who uses mathematical and experimental approaches to understand how animals move. He is curious about why animals are shaped the way they are and how they are so good at what they do. Both of David’s parents are chemists, so he spent a lot of time in laboratories growing up. When David started thinking about careers, they recommended he look into a career in medicine rather than research. However, in one of his early biology courses, David had the opportunity to work with microscopes during a lab session, and he was in awe of the phenomenal cell-scale world that lay before his eyes. One of the worst years in David’s life was his first year as a tenure track professor. He struggled in his new roles of running a lab, selecting research projects, and mentoring students. Over the course of that year, three of his four graduate students quit, and he really lost confidence in himself. There was one graduate student who didn’t quit in that dreadful first year of David’s faculty career, and this student agreed to work on a project that was totally new for both of them. David wanted to experiment on fire ants. These fascinating creatures have the ability to link up with each other to build water-proof rafts that help them survive the rainy seasons in their native regions of Brazil, and David wanted to explore how this was done. The results were published in the Proceedings of the National Academy of Sciences and also made accessible to children through publication in Highlights magazine. Recently, David traveled to attend the International Union for the Study of Social Insects conference in Australia. He calls this conference the Olympics for people studying ants since it is a big event that only happens every four years. In addition to the great science, highlights from the trip included eating leaf-cutter ants sprinkled on salad and going boating to observe alligators. Each year David’s lab takes an annual lab group photo with lab members stacked up in a pyramid inspired by the ants that they study. Their pyramid has gotten to be about six levels high now and in each photo David has to make the perilous climb to the top. This has been a lot of fun and is a great team building exercise because everyone has to work together to be successful. As long as you are producing good research, you can work on whatever you want. The number of projects doesn’t matter. David is a fluid dynamicist with expertise in the mechanics of interfaces between fluids such as air and water. He is a leading researcher in the biomechanics of animal locomotion. The study of flying, swimming and running dates back hundreds of years, and has since been shown to be an enduring and rich subject, linking areas as diverse as mechanical engineering, mathematics and neuroscience. David’s work in this area has the potential to impact robotics research. Before robots can interact with humans, aid in minimally-invasive surgery, perform interplanetary exploration or lead search-and-rescue operations, we will need a fundamental physical understanding of how related tasks are accomplished in their biological counterparts. David’s work in these areas has generated broad interest across the fields of engineering, biology and robotics, resulting in over 20 publications, including several in high-impact interdisciplinary journals such as Nature and Proceedings of the National Academy of Sciences as well as popular journals such as Physics Today and American Scientist. 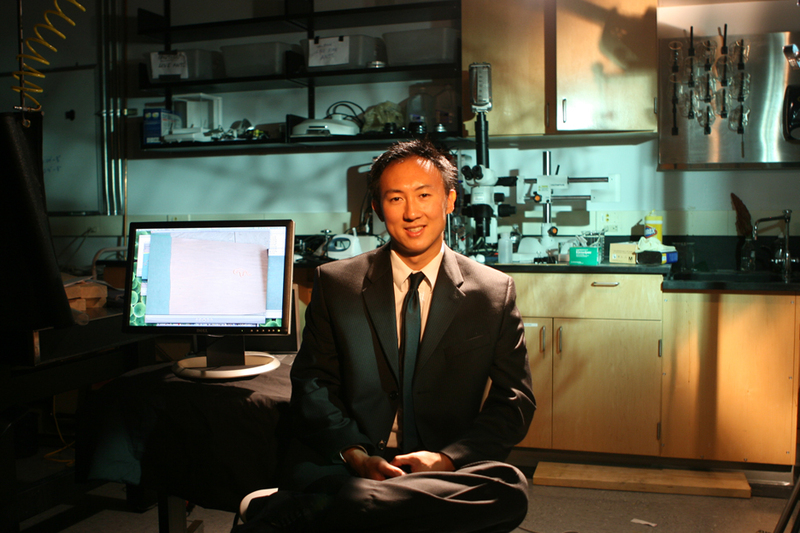 Dr. Hu has won the NSF CAREER award, Lockheed Inspirational Young Faculty award, and best paper awards from SAIC, Sigma Xi, and ASME. Over the years, David’s research has also played a role in educating the public in science and engineering. He has been an invited guest on numerous television and radio shows to discuss his research, including Good Morning America (2010), National Public Radio (2009-2010), The Weather Channel (2011), and Discovery Channel (2011). His ant research was featured on the cover of the Washington Post in 2011. His work has also been featured in The Economist, The New York Times, National Geographic, Popular Science and Discover magazine. Most recently, his laboratory appeared on 3D TV as part of a nature documentary by 3DigitalVision, “Fire ants: the invincible army,” available on Netflix.